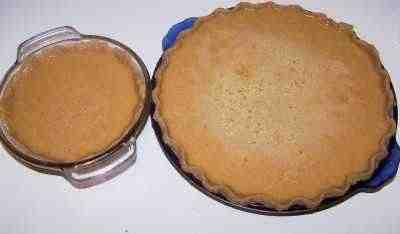 How to Make Traditional Homemade American Pumpkin Pie! If you've never had a pumpkin pie, you don't know what you are missing. 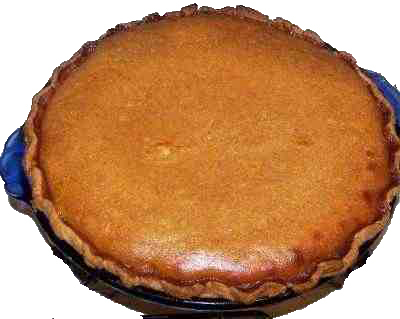 To many Americans, the appearance of a pumpkin pie on the table means Autumn and Winter are here. 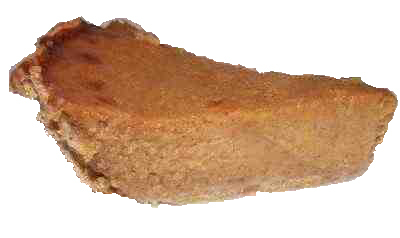 It is traditionally served at Halloween, Thanksgiving and Christmas dinners. 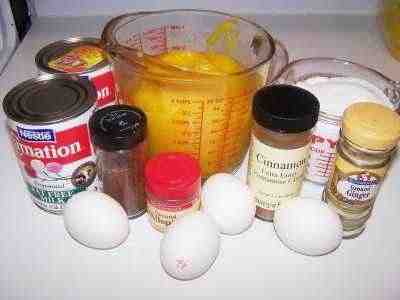 Pumpkin pie is one of the easiest pie you can make, too! And you probably take canned pumpkin for granted. You're there, the can is there, there's a pumpkin on the label... open it and mix it up with spices to make a pie, right? Ah, but a pumpkin pie made from a fresh pumpkin tastes so much better than the glop that was processed last year! Here's how to do it, complete instructions in easy steps and completely illustrated. And it is much easier than you think, using my "patented" tips and tricks! You can use either a fresh pumpkin or canned pumpkin. Fresh, obviously tastes much better! "Pie pumpkins" are smaller, sweeter, less grainy textured pumpkins than the usual jack-o-lantern types. grocery stores usually carry them in late September through December in the U.S. Note: the Libby's can of cooked pumpkin is just there for reference - it is the small can, so that gives you an idea of the size of a typical pie pumpkin. They're only about 8 inches in diameter. Here is what cooked fresh pumpkin looks like! You'll need 3 cups of pumpkin puree. Yes, I know there are ready-made pie crusts in the frozen section at the store, but they really are bland and doughy. A flaky crust is easy to make! Mix well using a hand blender or mixer. 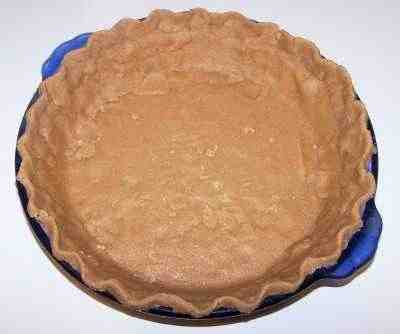 I like a deep, full pie, so I fill it right up to about one quarter to one half inch from the very top. Bake at 425 F (210 C ) for the first 15 minutes, then turn the temperature down to 350 F ( 175 C ) and bake another 45 to 60 minutes, until a clean knife inserted into the center comes out clean. I use a blunt table knife to test the pie. The knife below has already been stuck in the pie, and you see it comes out pretty clean, when the pie is done. With the Deluxe Food Strainer/Sauce Maker, you can make creamy apple sauce and smooth tomato sauce without having to peel and core! This muli-use strainer forces food through a stainless steel screen, automatically separating the juice and pulp from the seeds, shins, and stems. Perfect for purees, creamed soups, baby foods, pie filling, juices, jams, and more. Save time, effort, and money by preparing your own tasty sauces to be used immediately or boiled for future use. Do bushels with ease and in a fraction of the time. Includes the tomato/apple screen with easy twist on design and instruction/recipe booklet.